We've been out today on another NUKB rideout, this time to Glasson Dock with DocB leading again. Route was a follows: Glasson Dock then through Caton to Devil’s Bridge for a brew stop, then up to Sedbergh, Hawes, Ribblehead Viaduct, Ingleton, Stocks Reservoir, Clitheroe and home. Nice run today nothing of note happened apart from Billy-Whizz stripping off. Bike is still performing flawlessly and I keep getting better all the time. 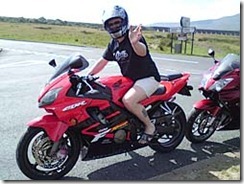 I organised a last minute rideout today to Glenridding, no takers unfortunately just me and Helen went in the end. Route was as follows: Trough of Bowland, Bowness, Kirkstone Pass, stopping in Glenridding, then re-fuel in Penrith, then back via A6 Shap, Orton, Tebay, Stop at Devil’s Bridge, then Long Preston, Gisburn home. Total length was 211 miles. Had a nice day out today, weather held out all day in the end. Didn't stop for lunch in Glenridding after all as it was just to busy. 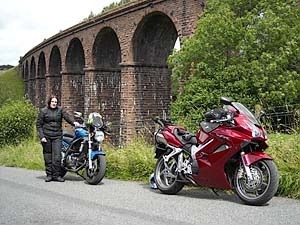 Stopped just outside Penrith on the A6 at a pub called the Beehive. We did get annoyed today though, poor drivers doing a pitiful 25mph over Kirkstone Pass. 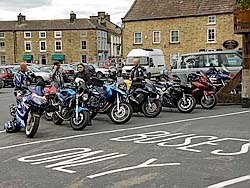 We were also told to dismount and remove our helmets before being allowed to fuel up at a petrol station in Penrith. Been on a rideout today with NUKB with BocB leading. It was a lovely run going over some nice goat tracks in the back of beyond in the Dales. Again we had another off today, which again was straight in front of me. TonyK2 went straight on at a tight corner and fell off on the grass, he was fine and continued on the rest of the ride. 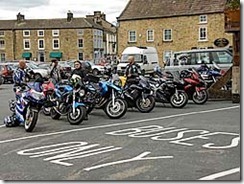 Stopped in Masham for lunch and we had some really good food in the Kings Head Arms, loads of free parking available as well in the square. We initially tried eating in Leyburn but there was nothing there to suit us, would recommend stopping in Masham to anybody.